Seven months after initially starting my training back on December 31st I was finally able to solo! And I couldn’t have asked for a more beautiful day to do so. Clear skies and little to no wind. Perfect. I did my usual pre-flight inspection and away we went. My instructor said that today’s goal was to do a few with him in the cockpit and if all went well, he’d step out. As we were taxiing for my first takeoff, I noticed a flock of geese on the runway. Great. Was this a sign of how today was going to go? We just had to keep an eye on them during our landings. As I called my intentions to take off, the flock walked off of the runway and flew off. My instructor pointed out that the geese didn’t call out their departure. Fail. We climbed out on Runway 18 to 700′, turned crosswind and leveled out at 1000′. As it was a bit cooler (cool is a relative term – let’s just say it was cooler than it has been), the plane climbed out a lot better than it has been over the past couple of months or so. I turned downwind and powered back. It was a nice smooth flight. Of course, my instructor told me not to talk too soon about it not being bumpy. But it was nice. I turned base and then final. I ended up a bit lower than I wanted on my first try, so I threw in some additional power to ensure we cleared US Route 50. Not a good thing to hit passing trucks. The landing was very good in my opinion…much better than they had been. One of my issues Id been having (which I think that I may have stated in a previous post) is that I was flaring too soon. He always told me to think about a slide. Find my aiming point, then when I get to within 10-15 feet of the runway, level out. I’d been flaring like I was in a jet. Doing that in a Cessna 172 at such low speeds increases the chance of a stall. And stalling at 50′ off of the ground is a bad idea. All six landings this morning was great! I did three landings with my instructor, before he got out. I pulled up to one of the paved taxiways. He signed my logbook which endorsed me to fly solo, shook my hand, congratulated me, told me to “go around” if necessary and exited the plane. My initial reaction was somewhat nervous, anxious, yet excited. I then switched to the mentality of “prepared”. I was prepared to do this. To that point, I’d had 91 landings with my instructor. I knew what to do, there was no question about it. I also knew that they plane would be lighter now, so that meant that I’d takeoff sooner, fly faster, and not come back down as easily. I had to ensure that I was ‘by the book’ while in the air alone. I believe that I was. I called my departure and off I was. Textbook takeoff and pattern work. On my final turn, I caught the glide slope, but had to power up a little at the end because I felt low after losing the glide slope. I crossed US Route 50, got to ground effect and leveled out. It was a smooth landing. As I pulled off of the runway, my instructor informed me that it was good as well, but that I needed to power back just a tad sooner. I went around two more times, each with good landings. 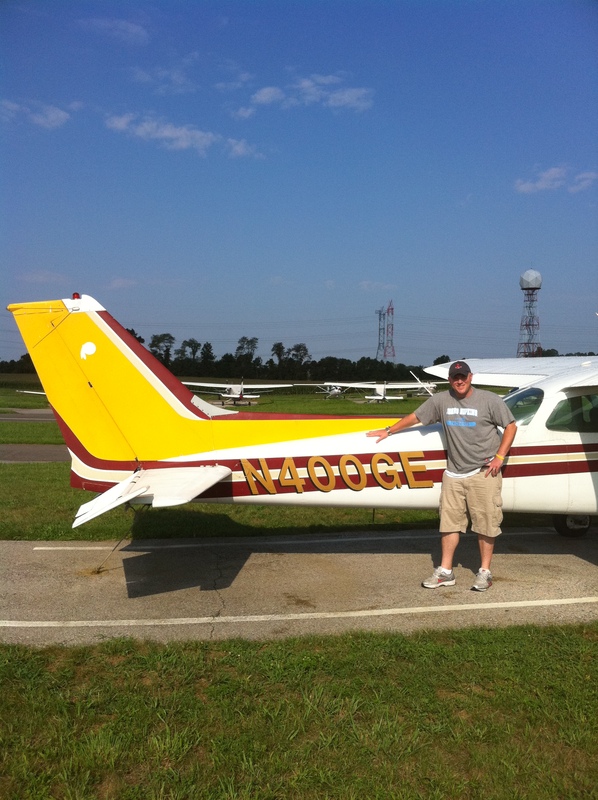 I parked after my third landing and got my picture taken with the plane (400GE). Then, my CFI proceeded with the customary cutting of the shirt tail. They cut out a rectangle from the back of your t-shirt, draw a plane with the tail number, names and date and then hang it up, along with the picture taken. Once I complete my training, I get to take the shirt tail with me. It was a day I’ll definitely always remember. Now that I have this behind me, I’ll start my cross-country work soon. I am looking forward to it! Congratulations! Have been following your blog from the beginning, as I also started PP training in December and am pretty much where you are in my progress…plus we share a first name! Nice job on the solo! Thanks for following! It was a long time coming with this solo thing. I knew it’d happen and didn’t want to rush it. Have you solo’d yet? Do you have a blog to track your progress as well? Thanks again! 29.9 hours, no solo yet, though should happen any day now. Had to take a few weeks off for various reasons, but ready to resume now. Had a tough time getting the flare and landing down, and felt as though I was just throwing hundred dollar bills out the window for the longest time. Interesting, because I’ve picked up everything else with minimal effort, but the landing was definitely my plateau!